The classic board game Scotland Yard was published in the early 1980s by Milton Bradley in the U.S., and Ravensburger elsewhere in the world. It's a game with clever mechanics, and it won the prestigious German Spiel des Jahres award for those mechanics in 1983. Here's how the game works in a nutshell... It's an asymmetric game, meaning not all the players win in the same way or even play in the same way. One player plays "Mr. X," a criminal of an unspecified crime who is trying to evade the other players until they have run out of movement options. All the other players play detectives trying to move around a board and land on the same space as Mr. X before they run out of movement tokens. The real trick to this game, however, is that while the detectives have pawns on the board showing their current locations, Mr. X does not. Instead, the player playing Mr. X writes down which numbered board position she moves to every turn. Most of the time the players have no real idea where Mr. X is, only the type of transportation (Taxi, Bus, Underground) Mr. X used to travel. At specific times during the game Mr. X's position is revealed, giving the detectives a little bit of information about where to go. The Scotland Yard board showing several detectives on numbered nodes. Mr. X could be on any node! The game plays in a little over an hour, and while somewhat suitable for a gaming audience was, as one might expect by a game published by Milton Bradley, intended for general audiences including children. 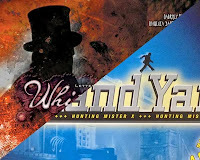 In 2011 Fantasy Flight published Letters from Whitechapel, an (informal) reboot of Scotland Yard. Since it was published by Fantasy Flight, the game was intended for a their usual target audience which was very different from the original: hobbyist board gamers. There's a saying in human centered design: "Design for everyone and you design for no one." Because Letters from Whitechapel had a more focused audience than Scotland Yard, it allowed designers Gianluca Santopietro and Gabriele Mari to make the following big changes that make the game better for hobbyist board gamers. For each change I will discuss the change itself, why the change couldn't work for Scotland Yard's original audience, and why the outcome is better for the new target audience's play experience. The very first big change that players will encounter in Letters from Whitechapel is the name, the feel, the art, and the narrative. Instead of trying to catch a nameless criminal for an unknown crime in a pseudo-modern London, players are detectives in the late 1800s Whitechapel district of London attempting to catch Jack the Ripper as he makes his famous kills. Why does this narrative make for better design and why couldn't it have been used in Scotland Yard? Well the latter question is the easier to answer: murdering prostitutes isn't an appropriate theme for a game that is supposed to be family friendly, and it's very possible that kids have never heard of Jack the Ripper. On the flip side, hobbyist board gamers almost definitely understand the reference. Why, then, does this narrative make for better design? In Nick's post on conceptual models, he wrote of how narratives help players structure mechanics in their minds and remember and understand them. Letters from Whitechapel's narrative begins to describe the mechanics of the game in 4 simple words: "Catch Jack the Ripper." With this description the players immediately know what they are doing (searching for someone who's evading them), why they are doing it (he's killing people), who they are looking for (Jack the Ripper), and where and when it's taking place. None of this is communicated as simply in the narrative of Scotland Yard. From the big things like the box to the little things like the Jack and copper-shaped pawns. In addition to the retheme's role in making the game easier to communicate and learn, it also the game more exciting. The flavor and art style (and mechanical changes to reflect the narrative, like the phase at the start of each round when the detectives try to get the "wretches" to safety before Jack kills one) draw the player into this fiction and make the game experience much more immersive, which itself improves the player experience. 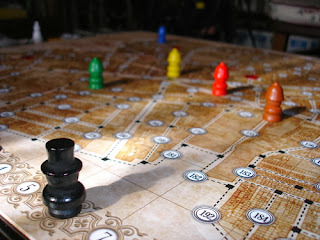 In Letters from Whitechapel, the detectives' starting positions are predetermined (with a little bit of player control). Jack the Ripper gets to investigate player positions for a short while, and then when the player feels confident in her knowledge of the detectives' true positions she decides which on the pre-placed "wretches" to murder. The detectives immediately know that Jack started there, although the starting positions are spaced out such that it will take the detectives a while to get to that start point. Every turn the detectives move their pawns, and then search for "clues" of where Jack has been. If they search a spot Jack has ever passed through, Jack puts a token there. This is in stark contrast to Scotland Yard, where the players' starting positions are randomly drawn, and Mr. X's position is revealed periodically. 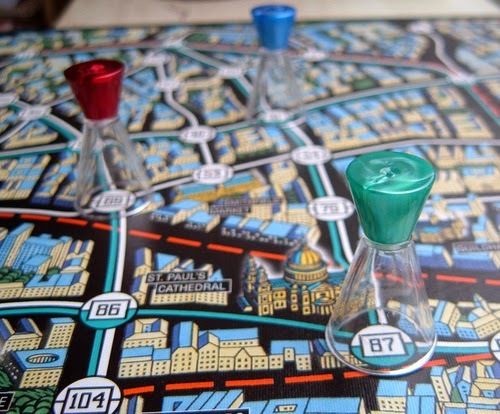 Why is this clue system a better design, and why couldn't it work for Scotland Yard's audience? I suspect that the original designers of Scotland Yard wouldn't think they could trust general player audiences to track down make consistent sequential deductions about Mr. X's whereabouts. This is why his position is revealed periodically instead of requiring players to, as in Whitechapel, go to the site of the crime and track the criminal for many turns, picking up the trail through structured search when it goes cold. Instead, Scotland Yard constantly re-reveals Mr. X's location to give the detectives a chance, expecting that the detectives will lose his trail after every couple turns. "You took the bus? That's only, like, 30 possible moves. I guess we'll just wait for the next reveal"
Of course, Whitechapel's clue system, for an audience that can handle it, makes the detectives feel like they're actually tracking the criminal, unlike Scotland Yard where it really just feels like they're all running around blindly. In Whitechapel the detectives rush to the scene of the crime, and search for clues. They must fan out to find Jack's direction, and then the detectives who are further afield must try to intercept Jack's trail further down the line. It feels exciting, especially when combined with the biggest change the game makes (below). The single biggest change from Scotland Yard to Letters from Whitechapel is the one that I haven't mentioned yet. Instead of one long unfettered chase in circles around London (in Scotland Yard), Whitechapel is much more structured. At the start of the game the player playing Jack the Ripper chooses (and writes down) a hideout. Whitechapel is then played in 4 "Nights" (rounds). Each night Jack makes a kill and starts at that location. He then tries to get back to his hideout before the detectives catch him (or a certain number of turns elapse). Why couldn't this work for Scotland Yard's design? Well, each night plays like a miniature version of Scotland Yard itself, and takes 30 minutes to an hour. This means that Whitechapel runs 2-4 hours, which is basically out of the question for a game intended for general audiences. Why is this structure good for hobbyist gamer audiences? The 4-night structure is built to play out like this. Night 1: Detectives have basically no information on Jack. They get to his kill location pretty late, and get maybe halfway down his trail before he makes it to the hideout, ending the round. Night 2: Detectives know which half of the board Jack's hideout is on. If they were really good they know what quadrant it's in. Now since they know where the kill is and generally what direction he's heading, they can get almost 75% down his path before he reaches the hideout. Night 3: By this round the detectives know almost for sure what block of numbers his hideout is in. If this night functioned the same as the previous nights they would almost definitely catch Jack. Fortunately for Jack, on night 3 he makes 2 kills, and can start at either one. Now the detectives know where he's heading but not from which direction. The game is built to let Jack slip through the cracks this round. Night 4: The detectives know where Jack is starting and where he is going; they have a high chance of catching him this night. This entire structure feels great for everyone involved. The detectives feel themselves tracking Jack more and more effectively, as the Ripper feels the net tightening around him. It feels authentic, rewarding, challenging and fun. And these mechanics could not be implemented meaningfully in less than 2 hours. Because the designers of Whitechapel were designing for a hobbyist gamer audience, they were able to give all of the players more structured agency than with Scotland Yard, and make the game great. Letters from Whitechapel is a great reboot of Scotland Yard, and it makes the game much better! Much of this is because the designers were allowed to focus on a particular audience and their gaming proclivities. They didn't have to assume their game could be played by a group of young kids followed by a group of smart adults. It's also worth mentioning, however, that even without the audience shift Whitechapel's design is much tighter than Scotland Yard's. Despite the improved design resulting from Fantasy Flight's reboot, Milton Bradley and Ravensburger had little incentive to focus their audience as FF did. The board game industry is economically tiny, and what money is made tends to come from games with mass market audiences (see Uno and Monopoly). This means that, usually, only poorly designed games (by virtue of targeting extremely broad audiences) are making big publishers serious money, while well designed games (by virtue of having focused target audiences) tend to rake in very little profit. Of course, this is why games with focused audiences tend to cost around $60, while mass market games can range between $20 and $35 - but in the end, 100 copies at $20 each is still way more money than 2 copies at $60 each. Tune in next week for a comparison of classic Risk to the exciting (somewhat) new Risk: Legacy reboot. Just one remark, Whitechapel was not made for or by FFG, they only published it. It is a European game made by Nexus in 2010. Sorry for the sloppy phrasing - I usually assume that readers understand the common relationship between publishers and games. I went ahead and edited the phrasing to say "published by" instead of "made by."